Watch these stem cell therapy videos on MS below and then investigate all your stem cell mobilization options. CLICK HERE to witness a Doctor describing Stem Cell Nutrition and informing People of Natural .. Patented ADULT STEM CELL RELEASER Capsules! Stem cells are in the news almost every day. There is a "GOOD" side to be reported .. and a "Negative Side". -- Sergio Lopez, 18, of Kyle, Texas, recently underwent a new stem cell treatment using his own bone marrow-derived stem cells in lieu of traditional surgery to repair a broken bone in his arm that would not heal. Traditional treatment for his pathology, known as a non-union, is to implant a device, such as a screw or plate. It's this implantation that deterred Lopez from receiving the surgery. "I have been planning on enlisting in the Army and I didn't want to have any metal implanted in my arm," said Lopez. "My surgeon, Dr. Sheely, suggested stem cell therapy as an option. It sounded like a good idea so we went for it." Dr. Christina Sheely, of Southwest Orthopedic Group, first met Lopez in February. When she learned he wanted to enlist in the military, she suggested stem cell therapy as an effective alternative to traditional surgery. "The use of a patient's own stem cells has been shown to effectively grow bone, specifically in non-unions, such as Sergio's," said Sheely. "I was pleased that I was able to offer a treatment that wouldn't keep him from doing what he wanted in life." The stem cell therapy procedure took 2 hours from start to finish. During the procedure, bone marrow is aspirated from the iliac crest (pelvis), and then processed in a cell concentration system. The system, from Austin-based biotech company, Celling Technologies, concentrates bone marrow allowing the desired cells to be delivered back to the patient. The surgeon is then able to deliver a cocktail of wound-healing cells directly back to the injured site. These cells will release growth factors, immune responses and have the potential to develop into new bone-forming cells. In addition to non-unions, patients' own bone marrow-derived stem cells are being used in a variety of sports-related and orthopedic procedures. "Non-union, long bone fracture applications using the patient's owns stem cells is our fastest growing segment," said Dru Dunworth of Celling Technologies. "Each day we are discovering the potential for more and more orthopedic applications using our cell concentration systems." Sheely has a follow-up appointment scheduled with Lopez in the next week. She is hopeful the procedure will prove to be successful. "I feel confident that we will see positive results in Sergio's arm," said Sheely. "I'm eager to use this type of stem cell therapy to treat patients with similar conditions." The surgeons at Southwest Orthopaedic Group (SWOG) are highly experienced, board certified orthopedic surgeons with extensive clinical and surgical expertise. SWOG doctors work together as a team to provide every patient the best possible treatment. Through their partnership and through recent dramatic medical advancements in the area of orthopedics, the surgeons at SWOG are leading the way in patient care. Celling Technologies, a SpineSmith Partners company, works closely with surgeons, scientists and engineers to research and develop innovative technologies in the emerging field of regenerative medicine. Celling's product offering focuses on autologous cell therapy. CLICK HERE for this chapter, and these studies, in the book "TISSUE REGENERATION"
In order to correctly reference this scholarly work by Christian Drapeau, George Eufemio, Paola Mazzoni, Gerhard D. Roth and Susan Strandberg (2012). When most types of human tissue are damaged, they repair themselves by forming a scar - a mechanically strong 'patch' that restores structural integrity to the tissue without restoring physiological function. ...Understanding normal healing; sources of, and methods of using, stem cells; construction and use of scaffolds; and modeling and assessment of regeneration. The book is intended for an audience consisting of advanced students, and research and medical professionals. Get the Stem Cell Research News widget and many other great free widgets at Widgetbox! Tens of thousands of patients with MS could benefit from the revolutionary treatment if the tests taking place at the Frenchay hospital, near Bristol, are successful. 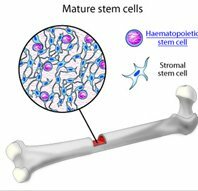 Patients are injected with stem cells taken from their own bone marrow, not from umbilical cords. This stem cell therapy procedure involves patients being injected with stem cells taken from their own bone marrow, in the hope that they will travel to damaged parts of the brain and repair them. It could take months or years for the treatment to begin to undo the damage caused by the incurable disease, which affects the central nervous system, and it is not known for sure that it will work. But researchers are confident the stem cell therapy will be a major breakthrough for the 85,000 people in Britain who suffer from MS, many of whom are left wheelchair-bound and paralysed. Neil Scolding, professor of clinical neurosciences for North Bristol NHS Trust, who is leading the trial, said: "We believe that bone marrow cells have the capability to repair precisely the type of damage that we see in the brain and spinal cord in MS.
"So by giving patients very large numbers of their own bone marrow cells thru stem cell therapy, we hope that this will help stabilise the disease and bring about some repair." The trial, which started six months ago, is one of the first to use patients' own bone marrow stem cells to treat their MS. It involves six people with MS, aged between 30 and 60, having a pint of bone marrow extracted from their pelvises. The processed material, containing stem cells, is then injected on the same day into the patients' arms. Over a period of months, the patients will be monitored closely and given regular brain scans to see what impact the stem cell treatment has had on them. Previous studies have shown that stem cells are able to develop into other cell types, travel through the bloodstream to the brain and are actively taken up by damaged areas. The Frenchay trial avoids the ethical controversy that surrounds many stem cell studies because it does not use human embryos. Although the first patients in the trial underwent the stem cell therapy six months ago, Prof Scolding said it was still too early to tell whether there had been any benefits. It is not yet known whether the MS sufferers will need more than one injection of stem cells. Liz Allison, an MS patient taking part in the trial, told the BBC: "I'm hoping there will be some improvement." Christine Jones, the chief executive of the MS Trust, said: "We're delighted that this new trial is going ahead and there will be an awful lot of people with MS watching it very closely." MS sufferers have previously been offered stem cell therapy in Holland. But those tests have proved controversial because they are expensive and because the cells are taken from babies' umbilical cords. This raises the risk that they will be rejected by the patient receiving them. Yes.. Stem Cells help control the inflammation process, ... Naturally in any stem cell therapy or stem cell treatment. FACT: The more stem cells circulating in your bloodstream .. and thru-out your body.. the closer you are to achieving Optimal health,aided by a natural anti-inflammatory properties of the organic ingredients in AFA stem cell nutrition and stem cell enhancer capsules. The word inflammation comes from the Latin inflammatio, which means “to set on fire.” Most people associate it with skin that becomes red, painful and swollen after they get a bug bite or a splinter. Those are common symptoms of acute inflammation. The inflammatory response is a normal process, and an important mechanism for health and stem cell therapy; without it, wounds and tissues would not heal. But, as with most physiological functions, it is vital that there is a balance. Unfortunately, inflammation that becomes chronic is one of the most troublesome processes in the body, and more stem cells can control it within the many types of stem cell therapy procedures. Want more Stem Cells circulating in your blood ? Release over 5 Million More bone marrow adult stem cells into your bloodstream within 90 Minutes of taking 2 Patented Stem Cell Releaser capsules. Chronic inflammation causes significant disruption of the normal functions of stem cells and – unlike acute inflammation – is usually silent, invisible and persistent. We can't see it or feel it, but it can cause a host of health-related problems that plague today’s society. One of the reasons chronic inflammation is such a problem is that it appears to interfere with the ability of your adult stem cells – your body’s natural agents of renewal – to do their job. Scattered chronic inflammation at the cellular level during any stem cell therapy procedure, makes it difficult for your stem cells to know where they are needed, because cells everywhere appear to be signaling them. Kind of like trying to hear someone in the middle of a stadium full of people who are all shouting at the same time. Causes of chronic inflammation include the persistent presence of pathogens, environmental pollutants, negative genetic factors and lifestyle, among other things. While not all of these causes are within our control, some definitely are. For instance, lifestyle factors that create inflammation include poor sleep, lack of exercise, chronic stress and an inflammatory diet. Inflammatory diets are those high in saturated fats, trans fats (hydrogenated or partially hydrogenated oils), margarines, alcohol, artificial sweeteners, dairy products, soda (diet and regular), well cooked red meat, MSG, nuts (except almonds and walnuts), white and brown sugar, and white flours. Anti-inflammatory foods include vegetables (especially dark leafy greens), fish and fish oils, flaxseeds, flaxseed oil, fruit (especially pineapple, mango and papaya), oats, olive oil, brown seaweed and barley. Obviously, you can significantly improve your quality of life by living an anti-inflammatory lifestyle. However, a more practical alternative in today’s helter-skelter world is to take patented stem cell releaser supplements. These stem cell nutrition supplement capsules give extra support to your natural stem cell renewal system. Disclaimer: This article is for educational purposes only and does not constitute medical advice. The opinions expressed herein are those of the author and any products mentioned, including AFA stem cell nutrition, while supported by science, are not intended to diagnose, mitigate or treat any disease or illness. These articles, products, statements, testimonials, reviews, and videos, have not been evaluated by the Food and Drug Administration. They are for educational and informational purposes only and do not constitute medical advice. The opinions expressed herein are those of the authors and ANY products mentioned or referenced,and are not intended to diagnose, treat, cure or prevent ANY disease or illness. Always consult your Doctor or health care professional with your health questions and concerns.